Junior asked Grandad "What about computers then?" "Oh, Grandad, let me count your hands and then tell me that bit again!" laughed Junior. "Right," said Junior. "Show me the left one." Grandad raised his left hand. "Oh, bother," said Grandad. "I thought it was left." "Yes, no," said Junior. "I asked for the left hand and you showed me the right one - the left one." "Make up your mind," said Grandad, "If the left one is the right one, then what's the other one?" "It's the right one, but the right one is the wrong one," replied Junior. "My head hurts," said Grandad. "I need a cup of tea. Then we can try counting my hands again." Grandma made them all a nice cup of tea. "I've looked out a few computers and bits," Grandad said. "Theres a KIM-1, a TRS-80 Model 1, a Sorcerer, a Compaq Portable III, an Apricot Portable, an Apple Macintosh, an Oric-1 and a Spectrum. I know there's a TRS-80 Model 2 somewhere, so I'll try to find it for another time. Oh, I also found a Magnetostrictive Delay Line memory that you might like to see. "Oh, and I just found a Commodore VIC20 in the attic." Junior was pleased; he had been looking forward to seeing some of Grandad's old computers. "I've got a computer, Grandad," he said. "It has a gigabyte of RAM and a 3.5GHz processor." Grandad was silent for a while. "Well," he said, "I can't compete with that! My first commercial computer had a kilobyte of RAM and a 1 MHz processor. I'll show you it." Grandad brought out his KIM-1 computer. It didn't look much like a modern computer, just a big circuit board with stuff on it. "I added the keyboard to it, because the original one was just a rubbish calculator-style keyboard that soon stopped working," he said. "I used this computer a lot, so I made up a unit with real individual key buttons. The top of the 'DA' key has broken off, but it will still push with a finger. I must replace it some day." Junior looked at it. There were only a few keys, and the display seemed to have only 6 characters. "That's right," said Grandad. "The keyboard enters hexadecimal addresses and data, and the display is used to show the address and data either as you enter it or when you want to see what is there. It only has a thousand memory locations, but believe me it takes ages to fill them in this manner!" Junior did a quick mental calculation. "My computer has a million times as much memory as this, and the processor is three and a half million times faster!" he said. Grandad corrected him. "The processor is only three and a half thousand times faster," he said, "But it has a 64-bit wide bus instead of 8 bits, and lots of other ways in which it is better. Things have moved on a lot!" Junior asked Grandad when this KIM-1 computer was made. "This one was made in 1976 by MOS Technology, the firm that designed the 6502 processor, and it cost about £200 in the UK," he replied. Junior was speechless for a while; he knew how much his real computer had cost, with all the bits and pieces. £200 in 1976 sounded like a lot of money! "So, in about 30 years, we have moved from junk like this to computers like mine!" he observed. "Yes, that's right," Grandad replied, not really liking the word that Junior had used. "It has all changed very quickly. In those days the only 'real' computers were enormous things in large rooms, that simply ate up electricity. Memory was very limited. Some big computers didn't even have the sort of memory that we use now, but used other sorts, such as magnetic core memory or even sound waves in mercury-filled tubes!" "Rubbish!" said Junior. "How can sound waves store stuff?" "Well, you see this little magnetostrictive delay-line memory here?" said Grandad. "This uses a solid block instead of mercury to delay the sound waves. It was made in 1974. Under the printed circuit board, just in the block live two things called 'magnetostrictive transducers'. When a rapid change of signal is fed into one, it makes a magnetic material change size slightly. This sends a sort of 'ping' sound through the block that is the base, bouncing around it in a controlled way until it comes out at the other transducer a little later. This block is called a 'delay line'. This tiny signal is amplified and converted back into an electrical signal. By sending a whole sequence of signals into the line, the same sequence comes out again a few milliseconds later. This can be fed back round again, so that it keeps going for ever. "By picking it off and changing it if necessary, it acts as a store for the data. It can store a few thousand changes, which are equivalent of 'bits' or Binary Digits is computer terms. Jolly difficult to use, though! You had to know just when the stuff was coming out, or it wasn't very much use! "The metal cover that you can see protects the amplifier circuit that receives the weak signals after they have passed through the block." "What does it protect it from?" asked Junior. "From electrical noise and interference that might upset its operation, causing it to lose the data," replied Grandad. "This magnetostrictive delay line was superceded by an IC (Integrated Circuit) called a 'Shift Register'. This uses a fixed set of stages inside, which each temporarily hold a logic state while it is pushed from one end of the stages to the other, a bit like a conveyor belt carrying something along. The rate at which it moves is set by a clock signal, rather than just the speed of sound in the delay medium. The number of stages through which it is shifted is defined during the design of the part, so everything is known very accurately and precisely. This makes it much easier to keep track of what goes in and comes out. 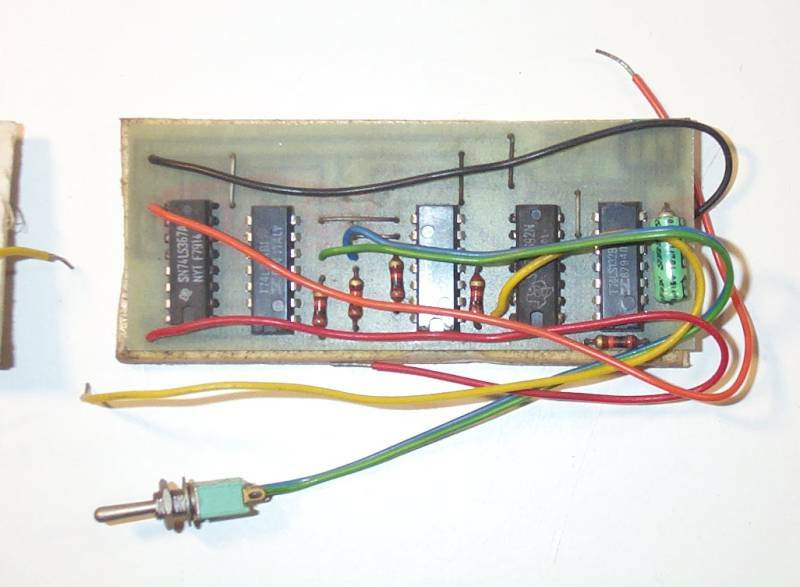 "Here is a box containing this type of shift register, which I used years ago as memory devices, just as I described. 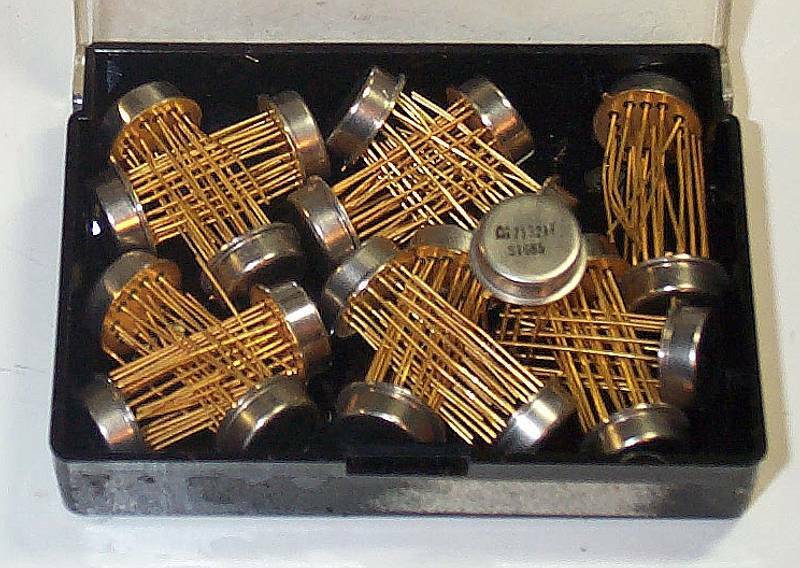 These are type S1685, made by a firm called AMI (American Microsystems Inc) in 1971. The S1685 has been obsolete for ages. It uses PMOS technology and I think needed +5v and -12v power supplies. There are 480 shift stages, so after exactly 480 clock pulses the data that had been on the input pin emerged on the output pin. "You can see why integrated circuits took over from other types of memory - they are much more precise and also a great deal smaller! If you look at one of these integrated circuits against the magnetostrictive delay line it really does show the difference, although both do much the same thing; they store roughly the same amount of data and were made around the same time. "The older mercury lines worked in a similar way to the magnetostrictive line, but used a long glass tube full of mercury to delay the sound." "What do they use now?" asked Junior. "They used glass delay lines in PAL colour televisions up until quite recently," said Grandad, not quite answering Junior's question. "The PAL system needs an accurately delayed copy of the previous picture line in order to work properly. A glass line working a bit like the acoustic memory could be made very accurately to delay by 64 microseconds, exactly one line interval for PAL colour television. But now they use SAW delay lines; SAW means 'Surface Acoustic Wave'. These are similar, but much smaller. They are still a kind of memory, of course." "Even in the KIM-1 they were using semiconductor memory," said Grandad. "This type has lots of separate places to store the bits, like storage bins. By sending the memory an 'address' you can point to the storage location that interests you, then put a bit into it or see what is already there." "No waiting for it to come round," said Junior. "That's right. Much easier!" said Grandad. 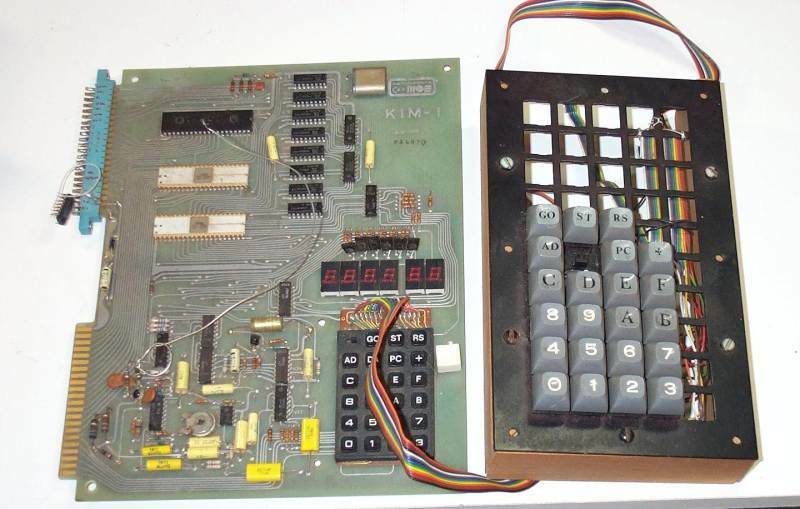 "The memory on the KIM-1 is called 'Static RAM'. The 'Static' bit means that if you put something in a location it stays there while power is on, unless you change it. The 'RAM' part means 'Random Access Memory', which says that you can just give it an address that you are interested in and it goes straight there. The acoustic delay-line memory is called Sequential Access Memory, because the data bits go through it in sequence and you have to catch them just right." "Is it called a 'SAM', Grandad?" asked Junior. "I suppose so," replied Grandad, "But in those days we were not so keen on snazzy acronyms." Junior thought he knew what was meant by 'acronym', so he decided not to ask. "What other computers did you have, Grandad?" asked Junior. "A lot of them didn't end up in the 'collection'," replied Grandad. "After all, you can't keep everything!" Junior had thought that Grandad did keep everything, but he decided he shouldn't say anything in case Grandad was upset. Grandad had raided his storage place, and found more stuff. "This computer was one of the first microcomputers used by small businesses as well as enthusiasts," he said. "It was made in 1978 by Tandy Corporation in America and sold by Radio Shack, which was their shop. In Britain the shops were called 'Tandy'. 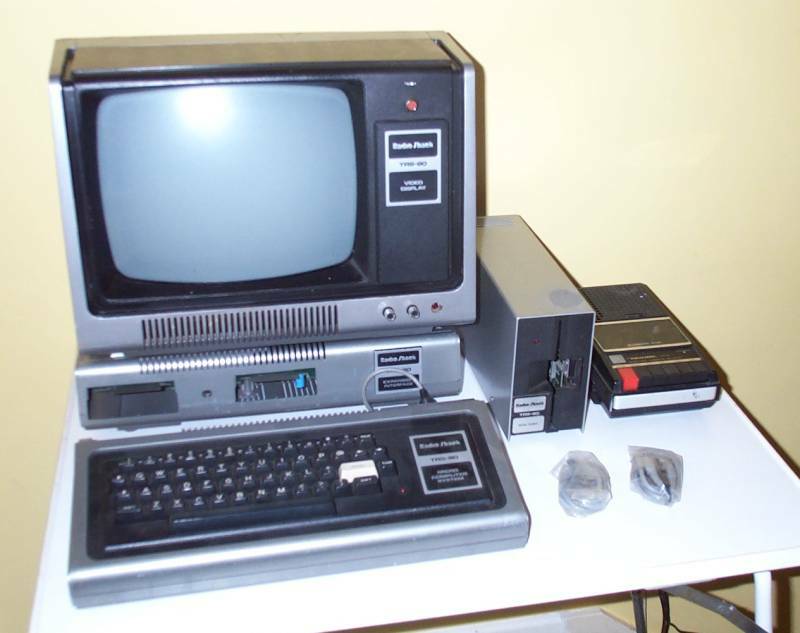 The TRS-80 Model 1 came in two versions. "There was the 'Level 1' which was just the keyboard unit and display. This had a tiny BASIC interpreter in a 4 kilobyte ROM [Read Only Memory] chip, and just 4 kilobytes of RAM [Random Access Memory]. It was the cheapest in the range, but good for hobbyists. "This one is the 'Level 2' which has a much more useful BASIC interpreter in three ROMs, giving 12 kilobytes, and a whole 16 kilobytes of RAM! This, together with everthing tha follows, uses 'dynamic RAM', which stores the data on thousands of tiny capacitors which have to be pumped up (refreshed) dynamically several hundred times a second continuously, or they forget. Memory that forgets isn't any use..."
Grandad shook his head gently, as if wishing that his own memory was better. "Dynamic memory is much, much cheaper to make, so large memories are practically always dynamic. "This 'Level 2' version was the one that most people wanted. It was still only the keyboard unit, though; you had to buy all the other stuff as extras, including the screen, which is an RCA television modified by Tandy! One advantage of the 'Level 2' was that it could be connected to the 'Expansion Unit', which is the box under the display. I didn't connect all the cables, there are so many! 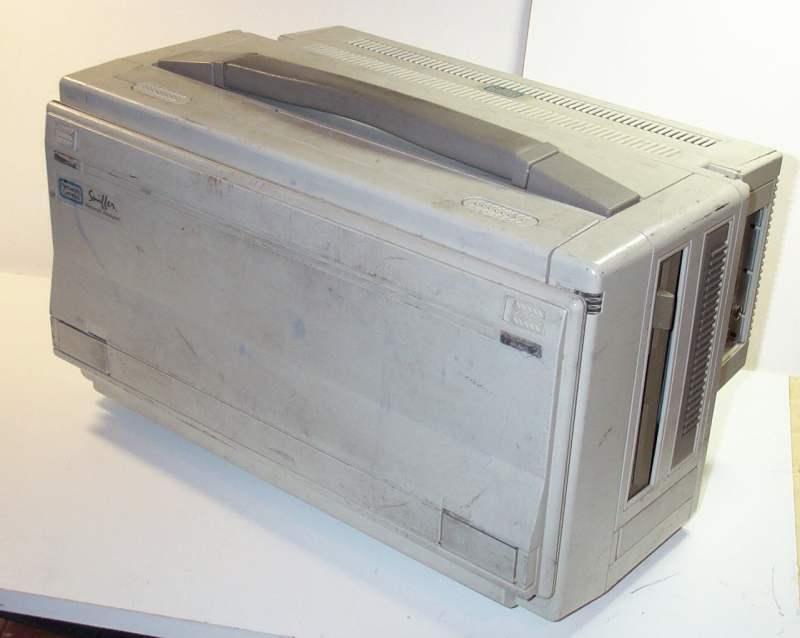 "The power supplies were separate cased units, like these. 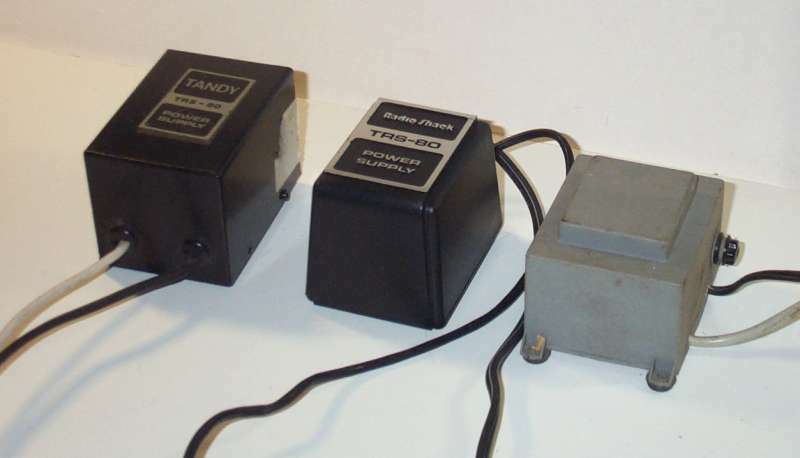 The one on the left is a Tandy 240volt British unit, then a Tandy 115v American one, and on the right is a 'copycat' 240v unit made in England for use with TRS-80s. 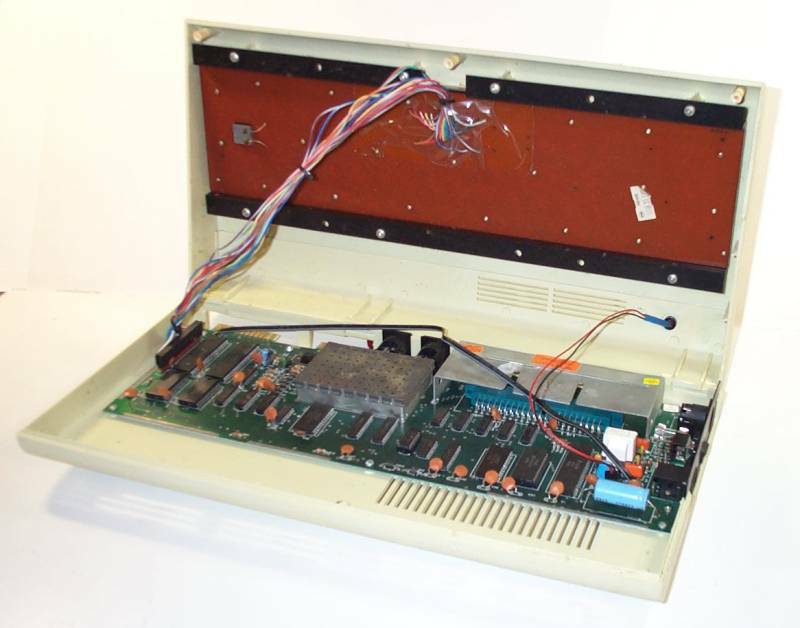 To use the Expansion Unit, two power supplies were needed, so Tandy made space for them inside the expansion unit. It was a bit tidier, but still loads of cables! "The Expansion Unit could hold more RAM, to give a total of 48 kilobytes. It also had a floppy disk interface, printer port, and space to fit a serial port. This Expansion Unit has all these things. "Somewhere I have got a different expansion unit, a Lobo LX80, which does much the same things but is in an aluminium case to reduce interference with radios. It also interface easily with Lobo's Hard Disk unit and with eight inch floppy drives, as well as coping with double-sided and double-density floppies as standard. "Adding Floppy Disks to a TRS-80 gave a lot more storage than the audio tapes used on that Tandy cassette recorder. Disks were faster, easier to use, and more reliable. 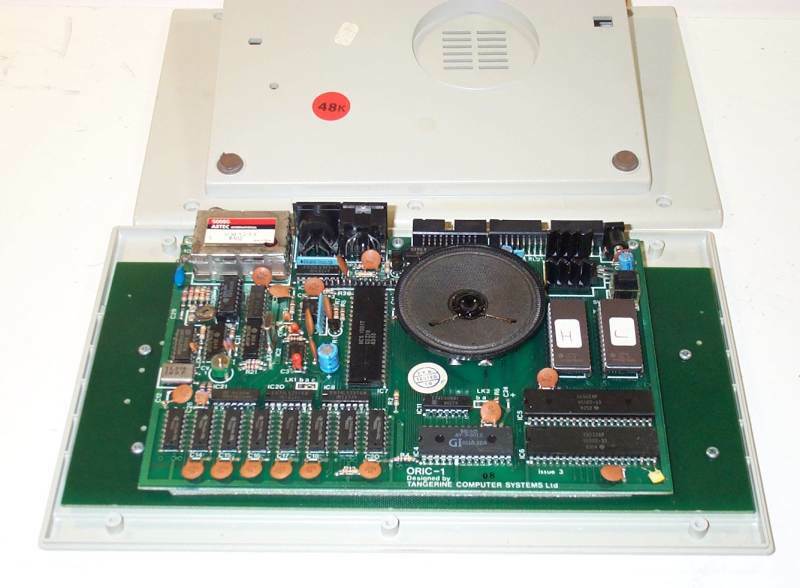 This disk drive was Tandy's first; a 5.25 inch drive in a case. These were only recently introduced at the time." "Tandy also sold a mains filter, because people had trouble with loss of data on floppy disks that their software people said were caused by mains-borne noise. But it was really caused by software bugs in their operating system, although they denied it. Several independent people produced operating systems for the TRS-80 that didn't have these bugs." "How much could the disks hold?" asked Junior. "Hah, well, it seemed a lot then, but sounds silly now," replied Grandad. "They held 75 kilobytes!" "That's not much!" said Junior. "It's a lot more than not at all," replied Grandad. "The 'mini-floppy' was the follow-on of the eight-inch floppy disks used in professional computers. It was engineered for cheapness, but they still worked quite well. "Some firms made adapters to improve the disk reliability. 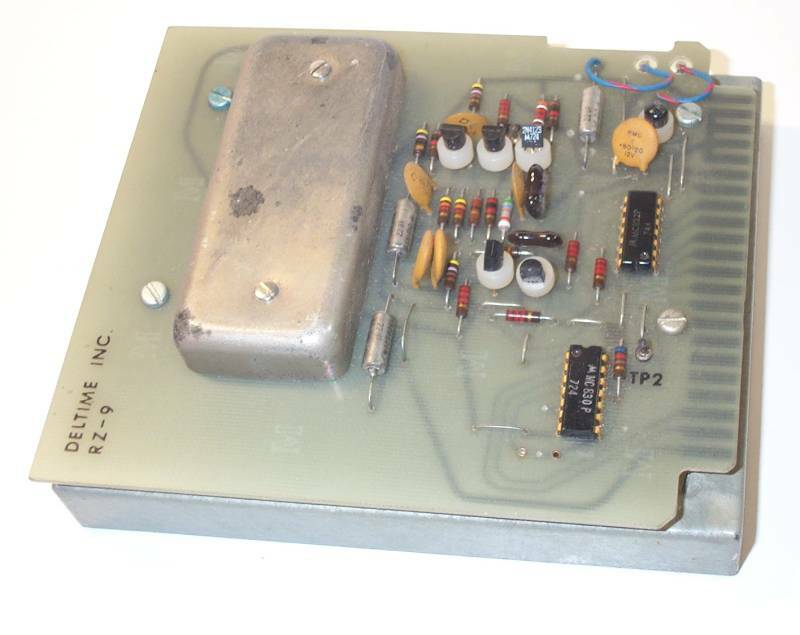 One of the best known was this Percom board. It helps the floppy disk interface to keep track of the disk data, for better reliability. They also made a 'doubler' that ran the disk as double-density instead of single-density, to squeeze twice as much onto it. There were lots of firms making add-on bits and pieces for the TRS-80! "Another popular add-on was the clock rate speed-up. The computer you just saw has one fitted. It increases the speed of the Z80 processor by producing a new, faster clock, which is well within the rating of the processor. 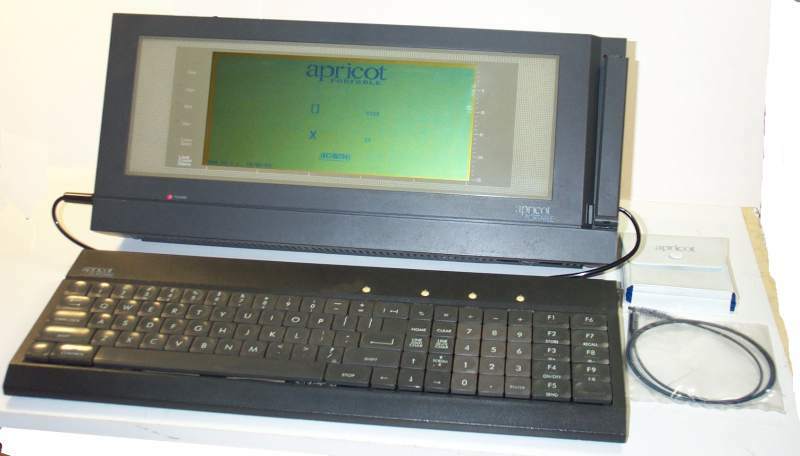 This one was made and sold by Johnson Microcomputers in the UK. The wide padded tape is used to stick it to the main printed circuit board of the computer. "A computer setup like this one here would have cost well over a thousand pounds! In those days that was many months wages. Even the best home computers these days only cost less than that, and now it's only a few weeks wages. That's progress!" "So if that stuff cost a thousand pounds when it was new, is it worth a lot more than that now?" asked Junior. "Sadly, no," replied Grandad, "But some people collect them as reminders of how home computers used to be." "Here's another old computer," said Grandad. "This is about the same age as the TRS-80 that you just saw. Like the TRS-80 it uses a Z-80 microprocessor and dynamic memory. 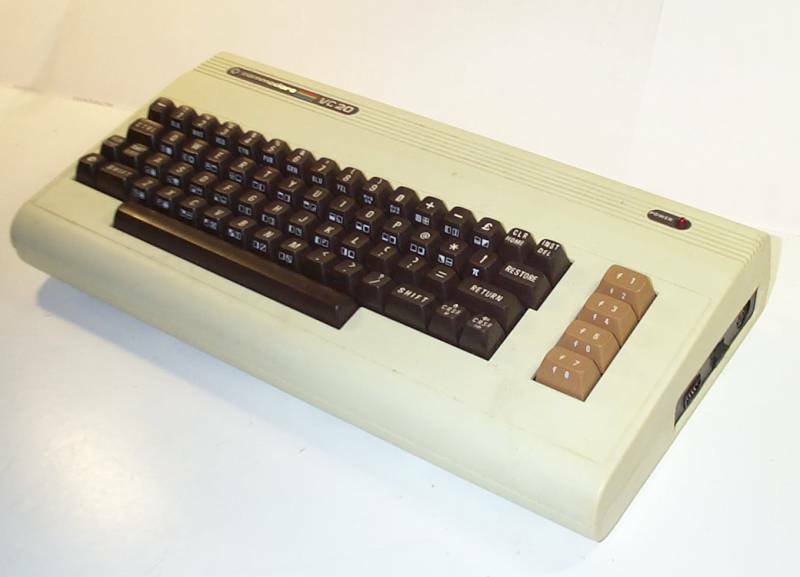 This one is made by Exidy and is called the 'Sorcerer'. It has a bigger keyboard than the TRS-80 and also normally runs a BASIC interpreter. There are several differences though. The Sorcerer has a plug-in slot for a cartridge that contains its operating software. This means that you need not use the BASIC interpreter, but, like my one here, can use other software. My one has the 'Development Pak' which is a tool for writing new software. It has an editor, assembler and linker." "I don't know what half of that means," said Junior, who had stopped listening part way through, "But it all sounds quite clever." "The Sorcerer was quite an interesting computer. 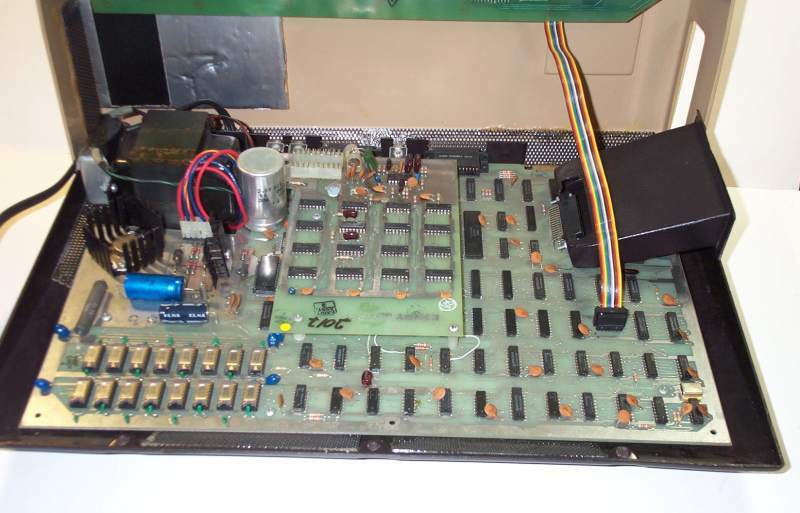 It could be connected to an 'expansion unit' that held more memory and could also have several plugin printed circuit boards of a standard type, unlike the TRS-80 which was one of a kind and tied you in. Unfortunately, the expansion unit for the Sorcerer was simply much too expensive for what it was, so not many people had them. "One of the things that I really hated about the Sorcerer was the keyboard. Although it is the proper size, with a separate number pad and reasonable-feeling keys, the key didn't do anything until it was released, not when it was pressed. This simply didn't feel right, and I found it very hard to use. Ah well. 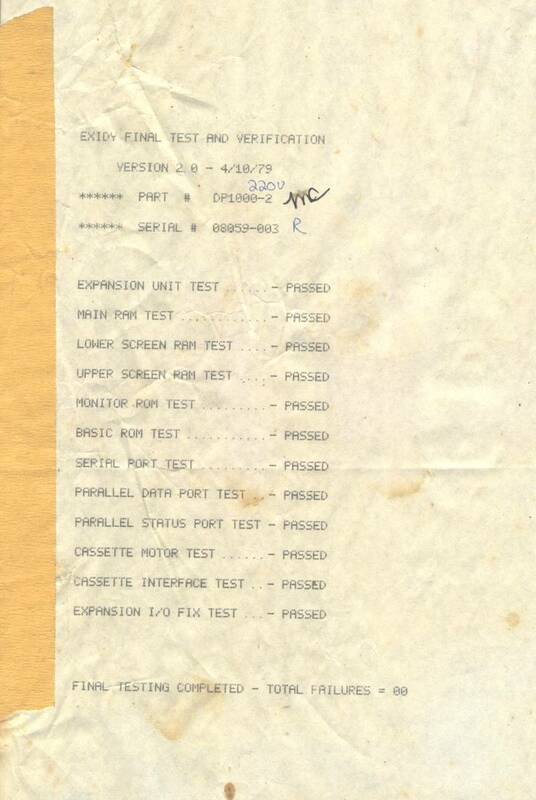 "Oh, look what I have found in the box - it's the original test results for the Sorcerer! Actually, I think these results are for an earlier one that I had which went wrong after a few months. See the date on it - 4/10/79. That's an American date, April the 10th 1979." Junior stared at Grandad for a moment, with a strange look on his face. "Grandad, I wasn't born for years after that!" he said. "It doesn't look so very old, but it's nearly twenty years older than me! Are all your things as old as that?" "Many are," replied Grandad, "And most of them are lots older. I didn't think you wanted to see new stuff." Grandad produced another old computer. "I can show you this one working," he said. It was a funny looking box with no obvious way in except for a mains inlet on the back. Grandad moved two small areas at the front, which were latches, and took off the keyboard. He put it on the table in front of the computer. "It's a flat screen!" said Junior, excitedly, guessing wildly. "Yes, that's right," replied Grandad. "Earlier Compaq Portables had ordinary cathode-ray tubes and were much larger. 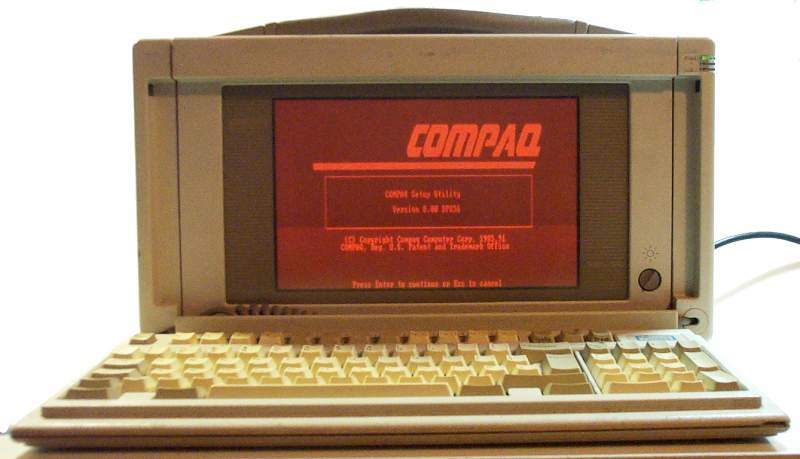 This is a Compaq Portable III computer made in 1987. 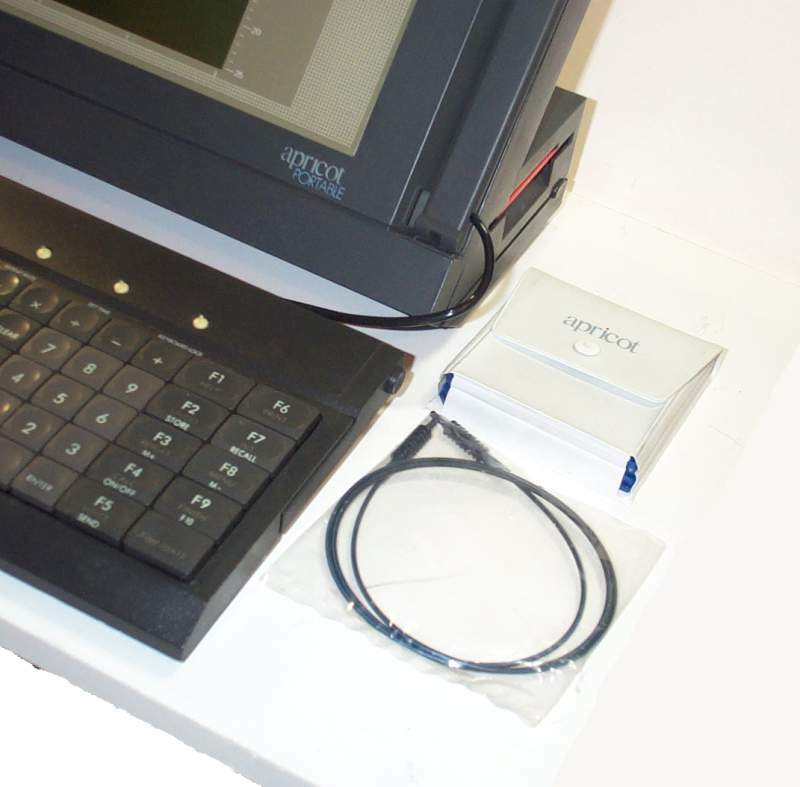 It has been adapted as a thing called a 'network analyser', to investigate signals on wired networks, but basically it is just a so-called 'portable' computer. Mind you, it is very heavy and still needs a mains supply. There are no batteries inside it, so it isn't what we call portable these days. 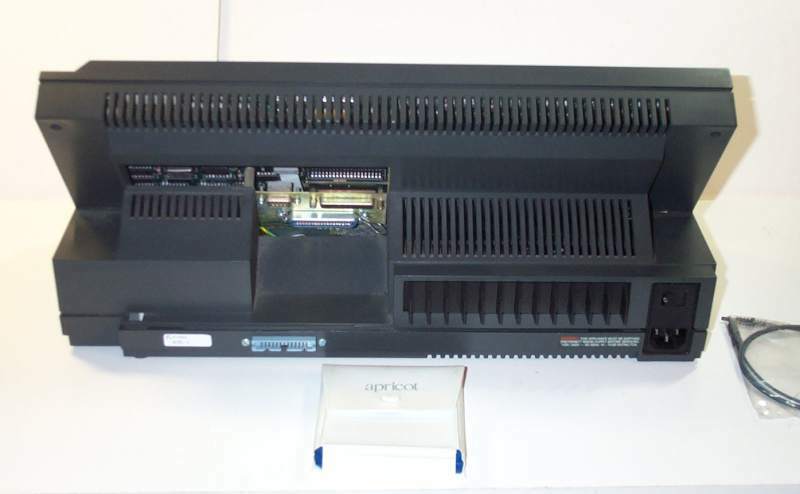 "You can see the bulge at the back, which is the Compaq expansion unit that houses the extra printed circuits that are used by the network analyser. "The screen is an early attempt at avoiding the need for a cathode-ray tube. There were two ways, the Plasma display, which is what this one uses, and Liquid Crystal Displays (LCD) which I will show you later. "The 'plasma' bit just means 'ionised gas'; it is always neon in this type of display, which gives an orange light. Basically, there are hundreds of small 'pockets' in the display, each filled with neon and provided with two electrodes. When a high voltage is applied to the neon, it ionises and glows orange. So the picture is made up from thousands of orange dots which are fixed in place and either lit up or not. "At first, it seems as if it is a colour display, but it is only one colour! Anyway, they are small and flat and thin, quite good for portable computers, but they need high voltages to operate the neon and so are quite difficult to design and make. "Here we are, then, this is what the display looks like. As you can see, it is black and orange. 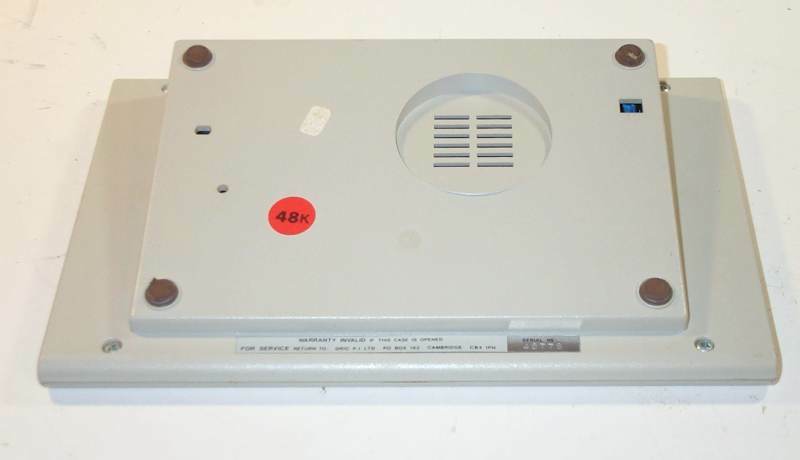 "This particular computer, because it was very expensive when sold as a network analyser, also has a high-density 1.2Mb five and a quarter inch floppy disk drive and a large, 40Mb hard disk built in. "It is still loaded with network analyser software on the hard disk, but the special network card seems to have stopped working properly, so it doesn't work in this way any more. Never mind, in those days they only had low-speed (10 Mb/s) networking using coaxial cable; its use is almost completely discontinued now." "O.K," said Junior, "How much did one of these cost?" "Don't let Grandma hear this," said Grandad. "The computer itself cost about £5,000 ($5800 in America) and with the Network Analyser software and hardware it was a lot more than that!" Junior was impressed by the screen, and by the way that it could be made to hinge upwards for easier reading! "I can't make Windows start, Grandad." "Not surprising!" replied Grandad. "Windows had only just been introduced, and was not any use at all for a network analyser, so it only has MS-Dos as its operating system. Today it's hard to imagine a world without Microsoft Windows, but it's not been with us so very long." "Here's another so-called 'portable' computer," said Grandad. Like the Compaq with the plasma screen, this one also needs a full mains supply in order to work. "Apricot computers were made by a British firm called ACT, which I think stood for 'Advanced Computer Technology'. They also made a bigger computer called a Sirius and a more conventional Apricot computer that wasn't portable, but I didn't keep either of those." Junior was quite shocked to hear Grandad say that he didn't keep something! It always seemed as if Grandad had hung onto everything! "The carrying case held all the bits," said Grandad. "It's a real devil to open, though. The little plastic latches are too wide, so that when one edge is released the other edge hangs on!" Between them, after a few minutes, they got the case open. Inside were the main computer, a keyboard and some odd bits. Grandad lifted it all out and they plugged it into the mains. "At least it didn't blow the fuse when we switched it on!" said Grandad. A red light labeled 'Power' lit up and a clunk came from inside. The screen showed some stuff. "Yes, I remember," said Grandad, "This computer has 832k of RAM. Unlike the IBM PC and its clones, it doesn't limit what they called 'Low Memory' to 640k but let it use all the space that wasn't specifically needed for something else. The 8086 microprocessor is a sixteen-bit processor with 20 address bits, so it can in theory address 1Mb; the rest is used for other things. "When I was using this machine, because it only had one floppy disk drive, I used lots of the RAM as a second disk, called a 'virtual disk'. That way I could do things that would otherwise need two floppies. Later on, I aded a connector on the back of the computer to allow me to connect up a real second floppy disk drive." "This computer has a 'Liquid Crystal Display' (LCD) screen," said Grandad. "Like the Plasma screen, this is flat, but it doesn't need high voltages to make it work. It's still only monochrome, though. Colour LCDs weren't available until quite recently." "Why does it say 'X' on the screen?" asked Junior. "Ah, the built-in floppy disk drive has failed test," said Grandad. "It clunks, but doesn't seem to accept this floppy disk that we offer into its mouth." The built-in floppy disk drive was at the end of the case. Grandad tried again to get the disk to work. "The 'Portable' takes 720k three-and-a-half inch floppies", he said. "These are almost identical to today's floppies, in a hard case with a spring cover to protect them, not like those eight inch and five-and-a-quarter inch disks in their flimsy casings, with open slots for the drive to access." "What is that curly bit of wire next to the keyboard?" asked Junior. 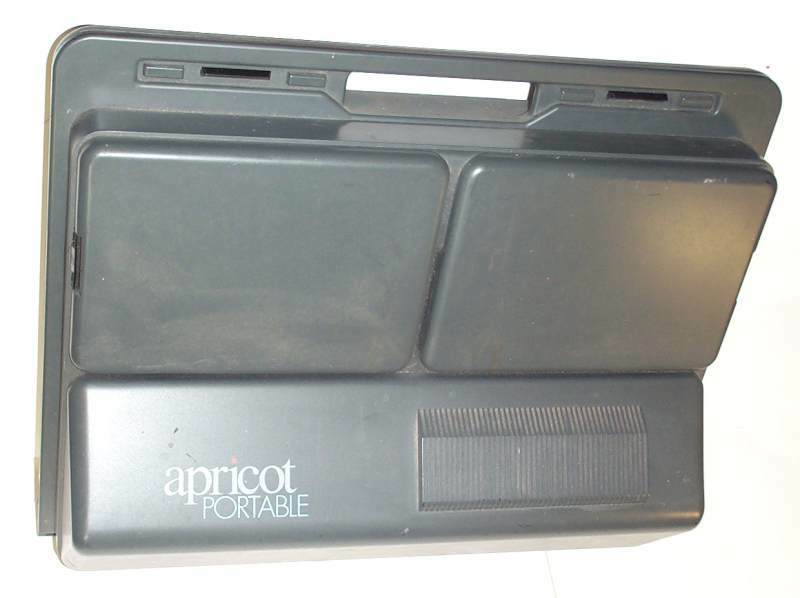 "The Apricot Portable was rather unusual," replied Grandad, not seeming to answer the question. "It had a keyboard which linked to the main computer using an infra-red beam instead of a wire. Four 1.5v 'AA' cells in the keyboard made it work. You didn't have to be right next to the computer to use the keyboard. But sometimes, such as in an office, where several of these computers were being used, there was a problem." "I know," said Junior, "Each keyboard was seen by all the computers, and it stuffed it." Grandad thought he understood Junior's description of the problem. "That's right," he said, "So they provided the little coil of 'wire'. It's actually a piece of optical fibre that plugs into the keyboard and the computer, so that each keyboard is tethered to its computer and doesn't try to talk to all of them. Very cunning. So the keyboard can be 'wired' or wireless, just as you please." Grandad turned the computer round so that Junior could see the back of it. "It's a jolly strange shape!" said Junior. "It is, isn't it!" replied Grandad. That gap at the back has a cover. I put it somewhere ... But I took it off in order to plug in the Apricot Modem unit. It seems as if I unplugged the Modem and forgot to replace the cover." "You can see the blue rectangular connector that I added, to let me plug in another floppy disk drive. I used this computer for quite a long time, but eventually got a more modern one and it just seemed to be put away somewhere." "There was another computer, very popular with people who wanted to use a word-processor or to draw pictures, but who didn't want all the nonsense of having to understand a computer as well. "The Apple Macintosh was another self-contained computer. This was also sort of 'portable' because everything was in one case, except the keyboard and mouse. Apple had made small computers before, but the Mac was deliberately made easy to use. 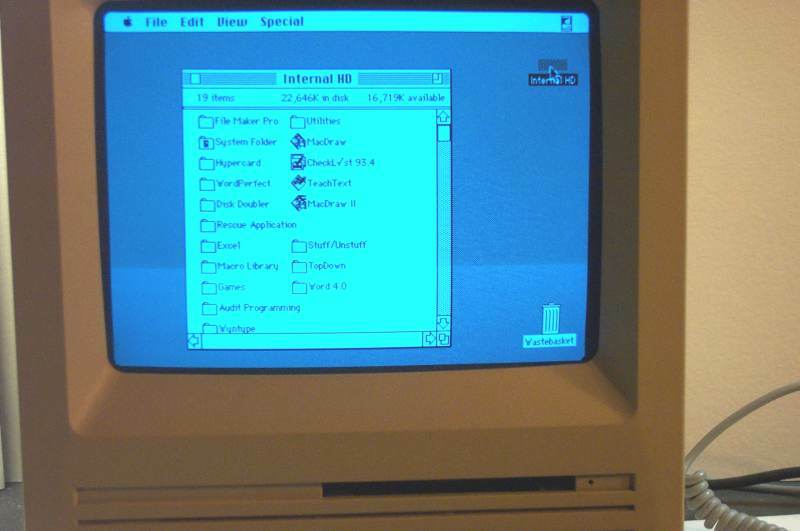 It employed a GUI (Graphical User Interface) for the first time on a production computer, and used a one-button mouse for navigation. Even an office secretary who had never used a computer before could soon feel at home with the Mac, it was so easy to 'point and click' with the mouse. Although the screen looks blue in the photograph, it is really nearly white. 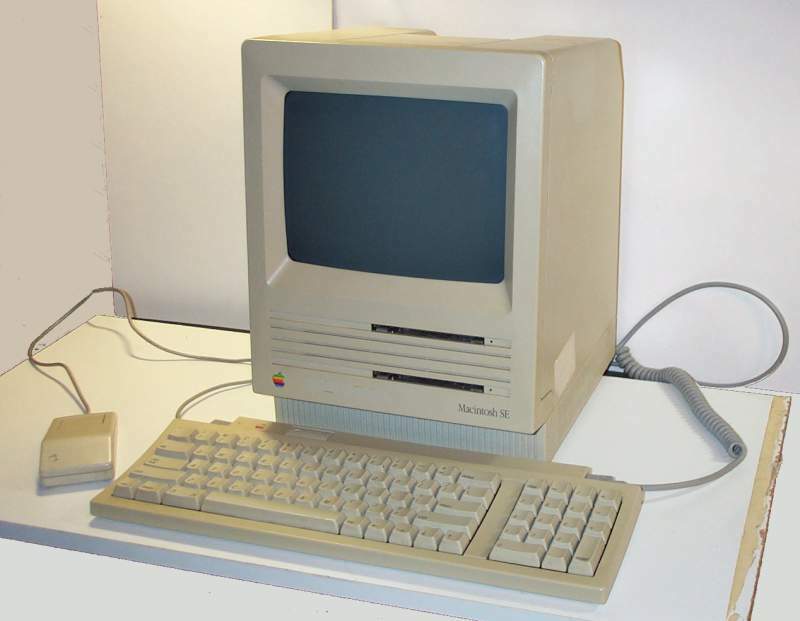 "The original Mac came out in 1984, with only one floppy disk and 128k of RAM, and cost £2500! All 'older' Macs use Motorola 68000 family microprocessors. "My SE here has 800k floppy disks, a 20Mb hard disk and 1Mb of RAM. It was introduced a couple of years after the original Macintosh at about the same price. I never liked the thing; by making it easy to use, Apple took away the ability to make it do what you wanted. It could only do things that it was set up to do by the software. Junior rather liked the look of he Mac, and played with it for a while. Grandad asked Junior if he would like to see an early 'popular' computer. "Yes please!" replied Junior, who seemed fascinated by all these computers. "Here's one of two of the fairly cheap colour computers," said Grandad. "This is the less well-known of the two, originally designed in England, but maybe best supported in France. 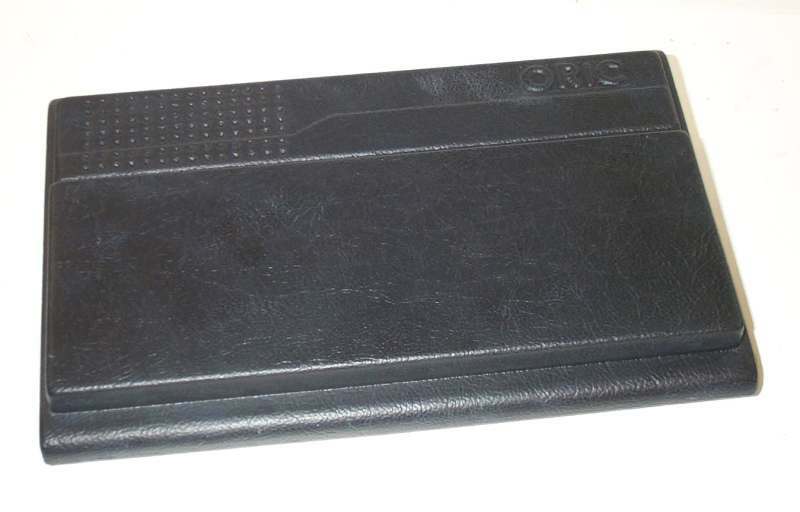 It is the Oric-1 computer. This one was made in 1983. As you can see, it is in a slim case with a small keyboard. Grandad turned the computer upside down, so that they could see the underneath. "This one has 48k of RAM, as you can see. In fact, it has 64k using eight ICs, but it needed a bit of effort to make the extra 16k useable. You can also see the dent and slots where the loudspeaker lives. 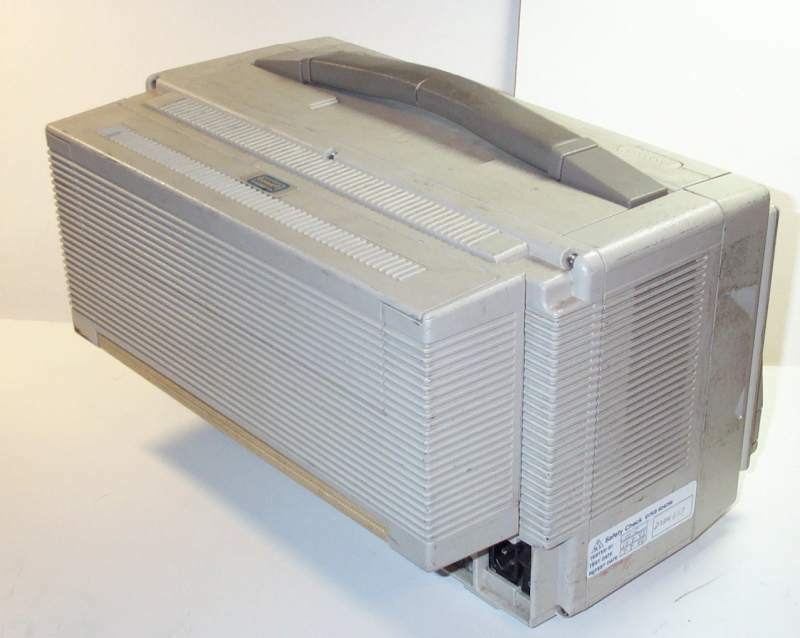 The Oric-1 had a 'real' loudspeaker, not a cheap microphone insert like some. It also had a proper sound-generator IC, so it could easily make much more interesting noises or music." "Programmes were stored on audio cassette tapes and could be bought at the time. With the computer you can see four commercial programme tapes. The biggest problem with the Oric-1 was that it often failed to read the tape data properly, sometimes time after time, so a lot of Oric owners got fed up with it. Much later, a cure for the problem was introduced to the French versions, but it was all too late by then. "It has a nice-feeling keyboard, unlike the Spectrum that I will show you next if you are still awake." "I am awake!" said Junior, who was just starting to get sleepy. Grandad showed Junior what the screen of the Oric-1 looked like. It needed a television in order to show an image. "This one is a bit out of adjustment," he said, "So the screen is a bit wobbly." "It isn't in colour though," complained Junior. "It can display in several colours," replied Grandad, "But it needs to be programmed in order to do that. Maybe we can write some easy programmes later?" "I'd like that," said Junior. They opened the computer, mainly because Grandad wanted to see inside it again. "It's quite simple, Grandad," said Junior, who expected the case to be full of little bits and pieces. "Yes, it's one of the modern generation of computers, using special custom-designed integrated circuits to save having loads of small ones. It became cheap enough to do that in this type of computer. "This design is actually quite reliable, except for the tape programme loading," said Grandad. "It had another sort of problem; if it was given power by the mains unit being plugged into the mains, it often wouldn't start working. You had to unplug the wire from the back of the computer and plug it in again to get it started. That's because it had a too short duration 'power-up' detection circuit. It's a pity they got those things wrong, because they gave the impression that it was unreliable, but really it wasn't. Not like some others." Junior was surprised that the computer had a black plastic cover to protect the keyboard. "Grandad, you didn't even lose the cover!" he said in delight. 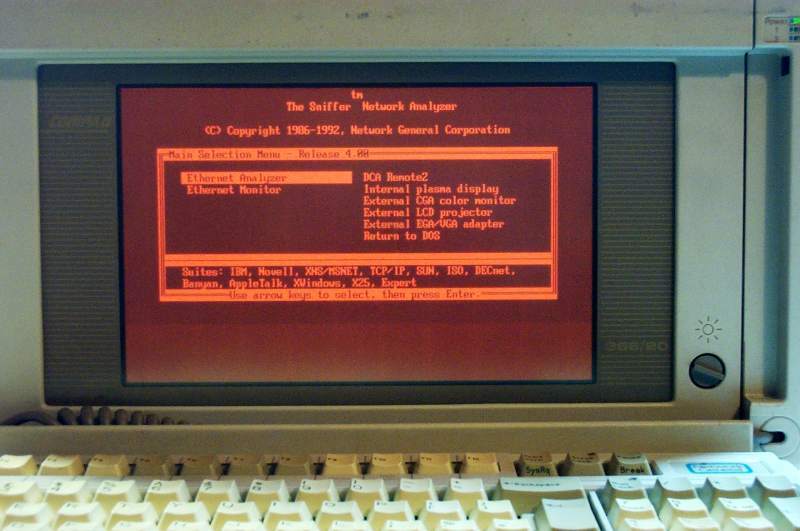 "No; although a variant was made, with better tape reading, the firm (Tangerine Computer Systems Ltd.) went bankrupt and there were no successors after that. Grandad showed Junior the second cheap commercial colour computer. "This is a Spectrum, made by Sinclair," he told Junior. 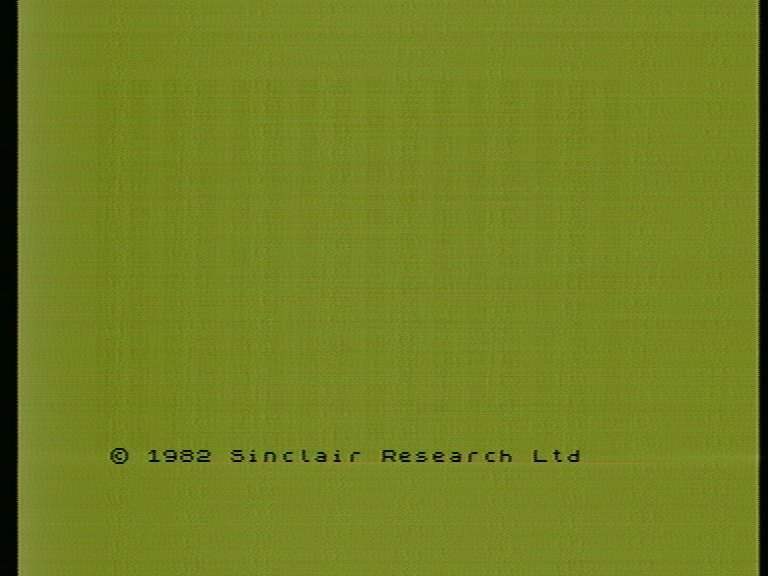 "Sinclair had made lots of low-cost electronics items before, including three computers call MK14, based on a SC/MP processor, and ZX80 and ZX81 based on the Z80 processor. They called themselves 'Science of Cambridge' when they marketed the MK14, for some reason. The ZX80 and ZX81 were fairly successful, but were a bit like the KIM-1 that I showed you in how they worked - not easy to use, and not good for people who didn't understand computers. "Then Sinclair brought out the Spectrum. Like the Oric-1 it was a small thing, with little keys laid out like a typewriter, but much smaller. But there the similarity ended. The Spectrum had squashy rubber keys that people called 'dead-men's fingers' because they felt so bad. Also, instead of typing a whole BASIC command in, such as 'For N = 0 to 7', as was the BASIC standard, the keys were marked with the BASIC keywords (in this case 'FOR') and if you used that key at the right time, that is what was entered into the programme. "The displayed cursor changed in order to indicate what would happen with the next key pressed, and the whole concept was jazzed up as being very useful, but I never ever got used to it. I had always typed the whole word 'LET' or whatever on the keyboard, and I couldn't un-learn the habit." "I suppose you were too old to unlearn," suggested Junior cheekily. "Huh! No, it was just not right having it done like that," replied Grandad. "No other computer did so, and so it wasn't even a good thing to learn to use." "The Spectrum had severe memory reliability problems. Many users wondered why only part of their programme would load, or why it crashed when they tried to run it. This was because the design had been over-cheapened and the memory timings and loadings were incorrect. Some Spectrums worked correctly, others never did work. It had other weaknesses - The thin metal trim around the keys was stuck on with double-sided adhesive tape, which often came unstuck. The rubber keys rapidly wore out or broke away from the rubber sheet that held them. The keyboard contact PCB matrix cracked and stopped working. The innards tended to overheat. In spite of that, lots of people bought them and the design must have made piles of money for Sir Clive Sinclair. "This is an early 'memory addon' for the first type of Spectrum. The board plugs into sockets on the main computer board, expanding the amount of RAM from 16k to 48k. It has eight 32k memory chips on it, which I seem to recall were test-failures from the production line of 64k dynamic memories, only one half being fully functional. The signal timings for the two control inputs, known as 'RAS' and 'CAS' on the memory chips, were produced using timing networks consisting of the resistors and capacitors (that look like resistors) which are stood away from the board, together with the threshold voltage of the two logic ICs, all at the end with the 'Sinclair' logo on it. Using rough-and-ready timing circuits like this made it pretty near impossible to meet the timing requirements for the memory chips! No wonder these were unreliable!" 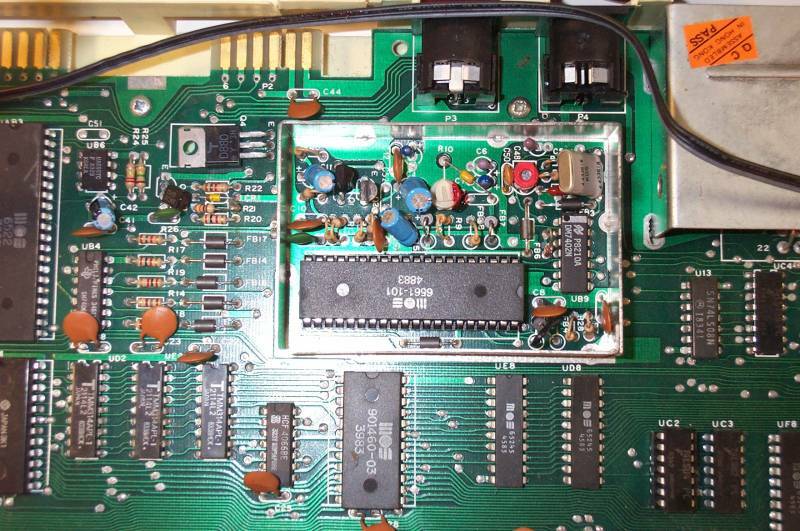 "In later Spectrums, like the one I showed you, the board was redesigned to give space for the minimum 16k RAM and the extra 32k all on the main board. Unfortunately they still used the same imprecise timing circuit, so it didn't become any more reliable." "Grandad, you keep talking about the extra 32k of memory being unreliable, but was the basic 16k unreliable in the same way?" "Gosh! You've been listening!" said Grandad. "I thought you were miles away and I was trying to get you to drift off to sleep! "No, the basic 16k of RAM was more reliable. The interface voltage levels for it were outside specification due to using resistors rather than proper buffers to separate two data-buses, but at least the timing signals for it came from what we called the ULA (Uncommitted Logic Array), which is the big IC called 'ULA6C001E-6' on the 'Issue 3' board you're looking at. These were timed quite accurately inside that IC. Of course, once it was set up by Ferranti to become that particular device, it was no longer a ULA, since it had become 'Committed' to a particular design. It was only Uncommitted when it was an unmetallised blank device." Junior looked blank as well. "The original ULA was a ULA5C something," said Grandad, "But it had serious logic design errors and needed extra components added to each Spectrum after it was built, tagged onto the legs of other ICs. With some versions they used two diodes and a resistor, others used a transistor, while some used an integrated circuit on a tiny PCB. It also had bad timings for the 'colour burst' signal that it generated (in the wrong place!) so a lot of people had poor or no colour on their televisions. The Spectrum had more ULA revisions than I've had hot dinners!" "It was interesting that Sinclair used Ferranti ULAs though," said Grandad. Unlike most ICs of that era, they were made using what was called 'I-squared-L', or IIL, which stood for 'Current Injection Logic'. The Ferranti device had an IIL core, with level shifters at the pin connections to make it useful with more conventional types of logic. IIL works by steering current from one place to another depending on the logic state, rather than changing voltage levels. One advantage is that it is inherently very fast, another is that the whole chip (well, the IIL part) always takes the same current from the power supply, so it doesn't make as much electrical noise as other types of logic, like TTL or CMOS. "You can see the large 15-ohm resistor that sets the 'injection current', just above the ULA itself." "That sounds clever," said Junior. "Was IIL a popular way of doing things, and is it still used?" Grandad replied "No to both. Sinclair used IIL on many of their designs, but I suspect that Ferranti let them have a good deal on it. I can't think of anywhere else it was used - except on Sinclair printers and stuff." "Was the Spectrum the last computer made by Sinclair?" asked Junior. "Oh no," replied Grandad. "They made another computer called the 'QL', which stood for 'Quantum Leap'; the name caused a lot of merriment amongst people who knew that the definition of 'quantum' was, roughly, ' The smallest amount of something', making the Quantum Leap the smallest possible leap that could be discerned. For some reason, another definition these days seems to be 'A large amount', which is the exact opposite and is just plain wrong. Ah well, we have a weird and perverse language. I could give you a hundred examples of words that seem to mean opposite things these days, like 'sophisticated', ..."
"Please don't bother," said Junior hurriedly. 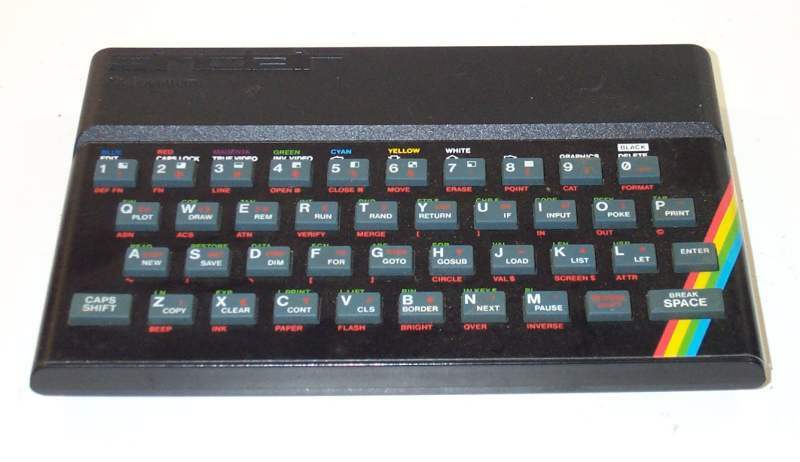 Junior had been looking at the Spectrum and comparing it with the Oric-1. "There's a lot more stuff in a Spectrum than an Oric-1," he observed. "Does that make it better?" "Not at all," replied Grandad. "In electronics, the reliability is greatest for the least components and soldered joints, all else being equal. The Spectrum uses oodles of parts compared with the Oric, and indeed the Oric is more reliable. They both have specific problems, but I know which I would want to have designed! 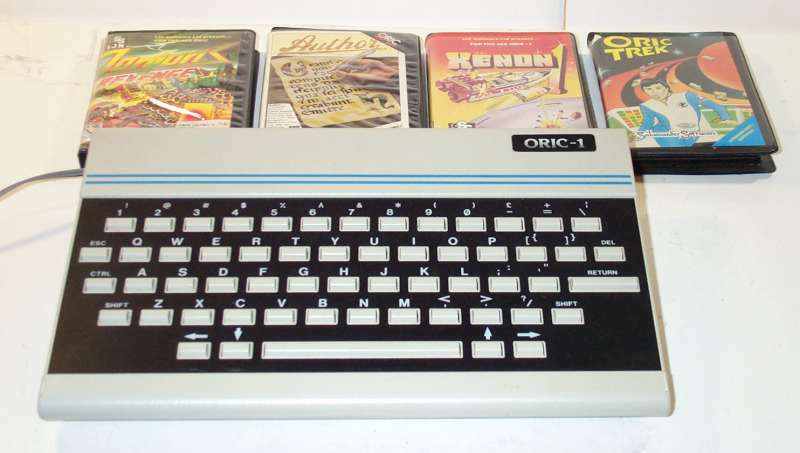 What a shame that the Oric-1 was not a commercial success." Grandad somehow got back to talking about Sinclair's other computer products. "Sinclair sold the Spectrum innards in a complicated bit of kit called the 'One Per Desk', a sort of telephone plus display plus computer, made by ICL and never very successful. 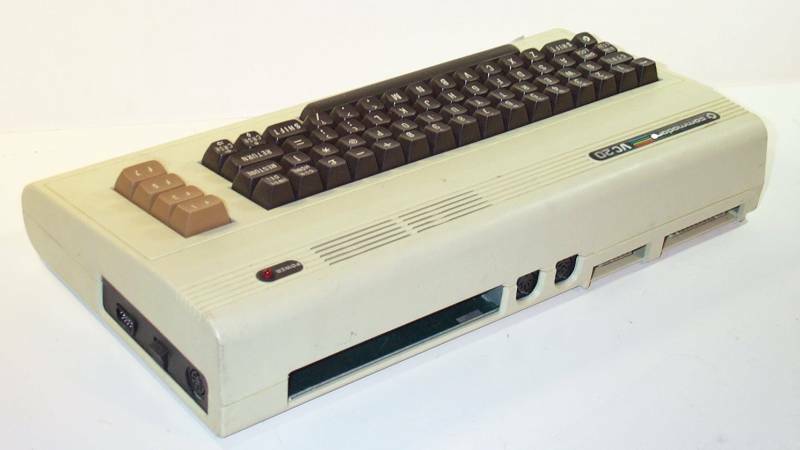 "They also branded more conventional computers, the PC200 which was a 'too late' copy of the IBM PC, and the PC500, which was really an Amstrad PC1512 sold branded as 'Sinclair' after Amstrad sold their business to Sinclair. "I'll show you an Amstrad PC1512 and their PC1640 next time you come, if I remember." Junior decided he might need to wait quite a while. Grandad had found another computer; this was a British made Commodore VIC20. They looked at it for a while. "This was a funny little thing," said Grandad. "It's in a rather nice case, with a decent keyboard that looks and feels like a proper one. It does colour on the right screen, and has a 'proper' BASIC interpreter built-in, using full entries rather than those silly Spectrum keycodes. 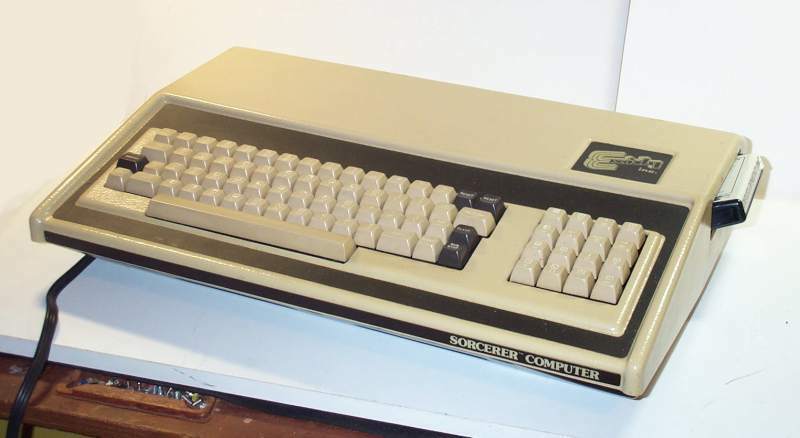 Being a good bit bigger than the ORIC-1, it has space inside for the propoer-sized keyboard, and a slot on the back for a plug-in 'cartridge' that can contain extra memory, games, or whatever." "How much memory does this one have?" asked Junior. "Well, not a lot!" replied Grandad. "Much less than the Oric. 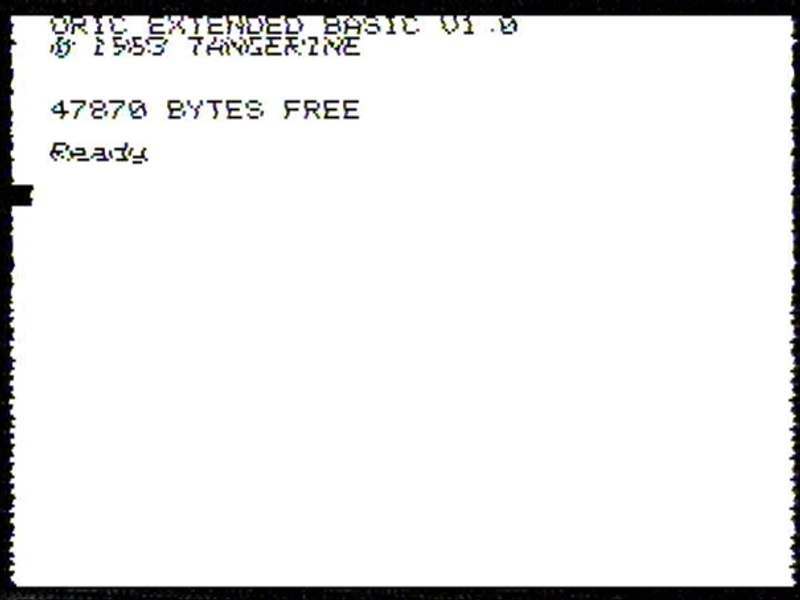 This VIC-20 has just three and a half kilobytes (3.5kB) available for the user; the small extra bit is used for the screen memory and whatnot." "That's not much! Could more be added?" asked Junior. "I just told you that extra memory could be plugged into the slot at the back, in a cartridge," replied Grandad. "It was rather expensive, though. An extra 8kB of RAM cost over £24. Also, if you needed extra RAM and also wanted to use, say, a game cartridge, you suddenly found that you couldn't plug two cartridges into one slot!" "So then what happened?" asked Junior. "So then you also had to buy a 'slot expander'. 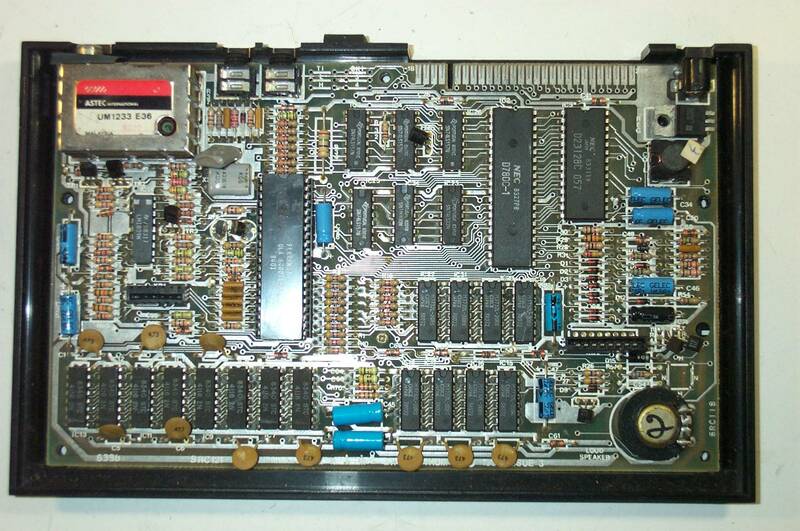 A 'four slot motherboard', just a board with four sockets and four switches on it, plugged into the cartridge slot and allowed up to four cartridges to be plugged into it. But it cost £33.35, and was a bit tricky to use," said Grandad. "Golly, it sounds difficult to actually use a VIC-20 for anything proper!" commented Junior. "Yes, indeed. There were some business-orientated cartridges, but jolly pricey!" said Grandad. "A word processor called 'Wordcraft 20', that had some extra memory included in the cartridge, cost £125, which all made for an expensive setup. It still only used an audio cassette tape recorder to store data - if you needed a floppy disk drive and a printer, they cost another £460 together. Because the screen only had a few characters on each display line it was really not much good for word processing (it only had 23 lines of 22 characters per line). "Because the price was right, though, Commodore sold lots of these computers before they discontinued it, in 1985 if I remember right." Grandad removed three screws and opened up the case, just as Junior knew he would. "What's inside the funny tin box?" asked Junior. "Let's take off the lid and look inside," said Grandad. Just what Junior wanted to happen. "It's the circuit that generates the display signal, usually called the 'video'," said Grandad. "The box screens it so that it doesn't create interference, or get interfered with by digital stuff from the processor. 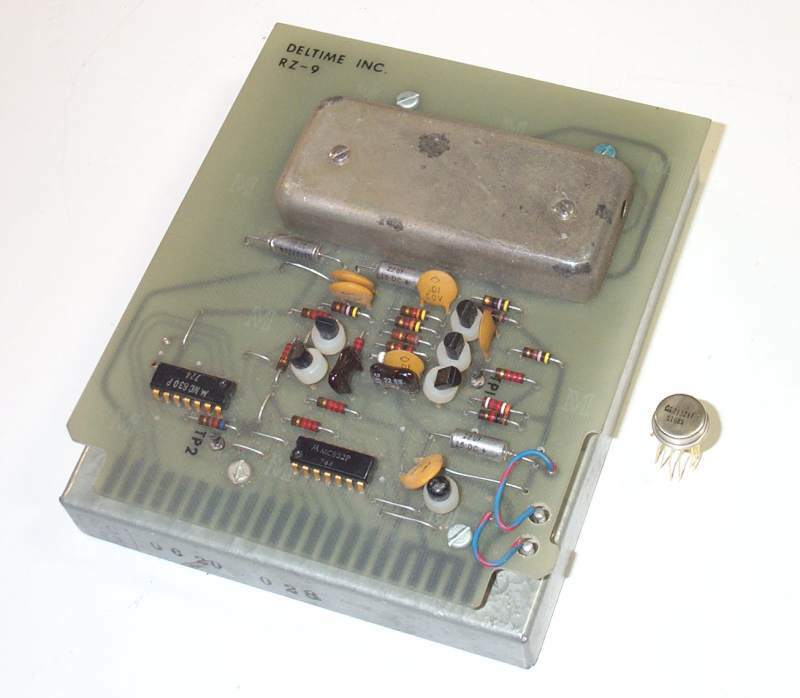 The big intgrated circuit is what was known as the Video Interface Chip, VIC for short. It gave the computer its name." "When was this computer made?" asked Junior. "We can get a pretty good idea by looking at the date codes on some of the integrated circuits," said Grandad. "Normally, in the mass-production world, the chips didn't sit around for more than a month before they were used. 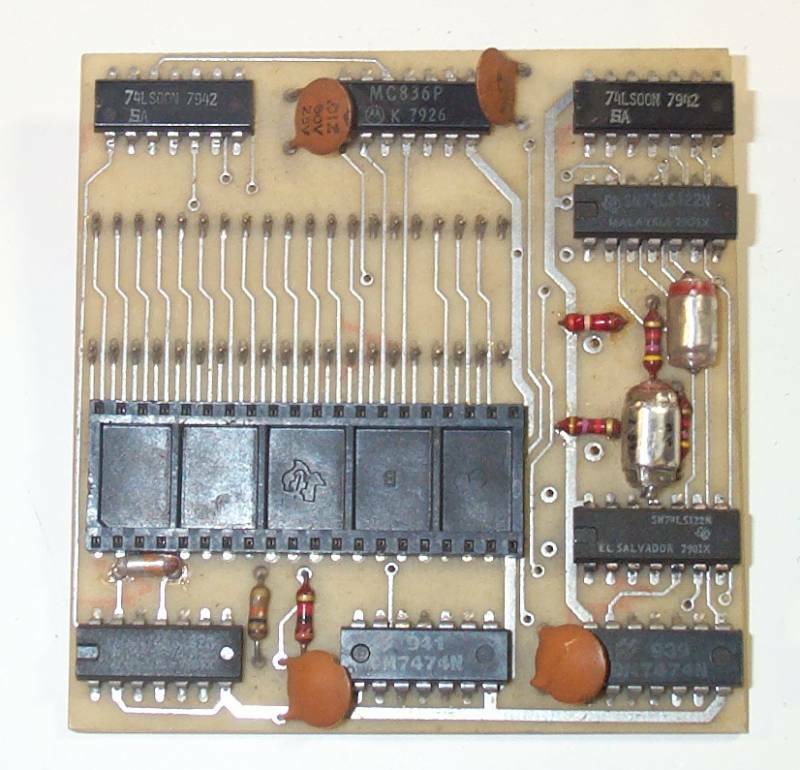 In fact, it was quite common for a chip to be unavailable when the board was assembled, so they used a socket and plugged in the chip when some came in. "Let's see - Well, actually the VIC chip seems to be newest, with a date code of 4883. That means that it was made in week 48 of 1983. So I reckon the computer was made late in 1983." "Grandad, why is it called a VC20 and not a VIC20 on the lid?" asked Junior. "It was made for the German market," replied Grandad. "They called it a VC20 because,in German, VIC sounded like a very rude word." "What word was that in English?" asked Junior. Grandad pretended not to hear him. "Look at the label on the bottom," he said hurriedly. 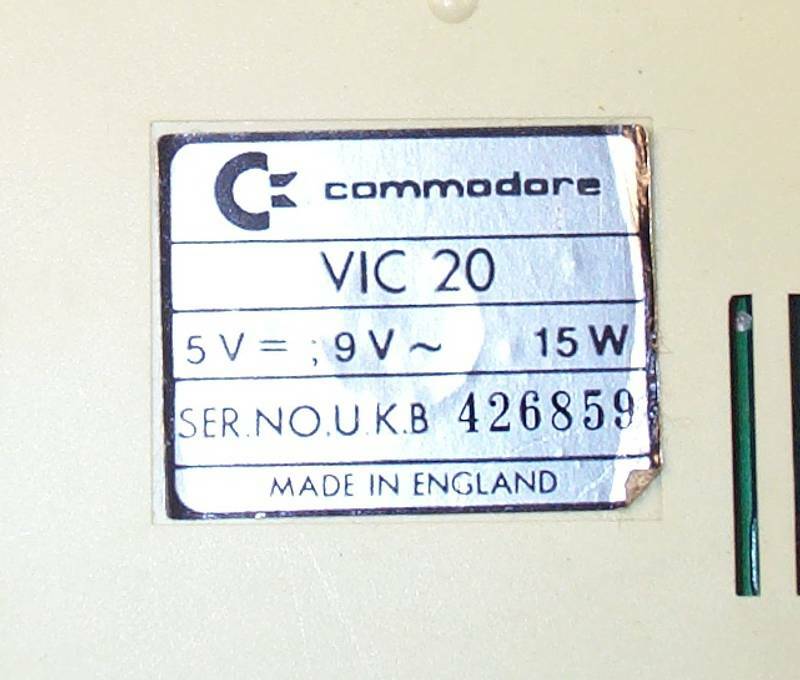 "It says that it's a VIC 20 after all. 'MADE IN ENGLAND'," he said proudly. But Junior had previously noticed another label inside the computer. "Grandad, when we looked inside the computer, the orange sticker on the metal bit near the screened box said "Assembled in Hong Kong," he said. "Is Hong Kong part of England?" Grandad just pressed a few keys on the computer and muttered a few things that no-one could really hear. Junior decided that he would continue visiting Grandad and asking to see more computers until Grandad produced them. He didn't realise that Grandad was going to take his time 'finding' them. Grandad enjoyed seeing Junior, and delving into the past. He wanted many more visits as Junior grew up.